This illustration shows an event known as 'the battle of the wine barrels'. 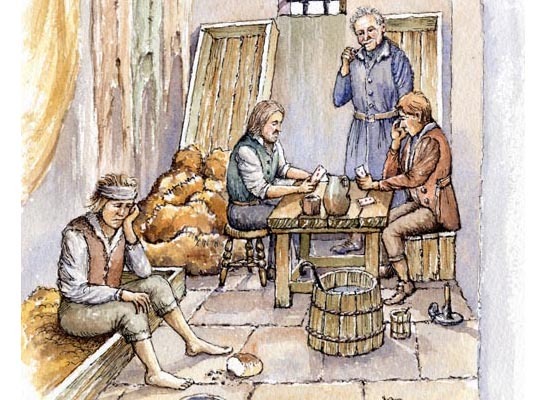 The O’Driscolls were both traders and pirates. In 1537 they captured a vessel bound for Waterford with a cargo of Portuguese wine. 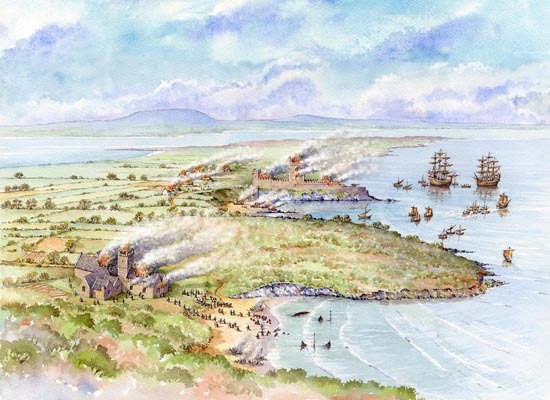 The Waterford merchants recaptured the ship and as a reprisal launched a five day attack on Sherkin Island. 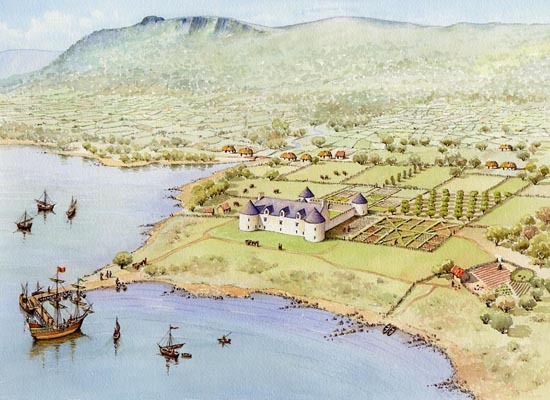 They destroyed O’Driscoll’s castle and friary, either sank or captured his fishing fleet and ransacked the island. At low tide, a few wooden ribs stick out of the sand, a reminder of stormier times. Beale Bar was one of the hazards facing shipping entering the Shannon. 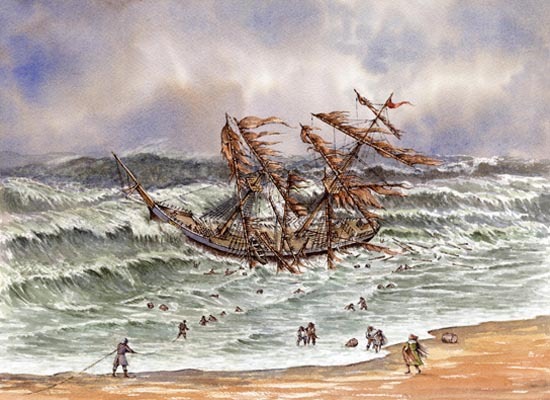 If the tide was too low, ships could be grounded on the sandy, offshore shoals. The Limerick-built sailing brig, Thetis, was homeward bound from Quebec with a cargo of timber in 1834 when a furious gale blew her on to Beale Bar. 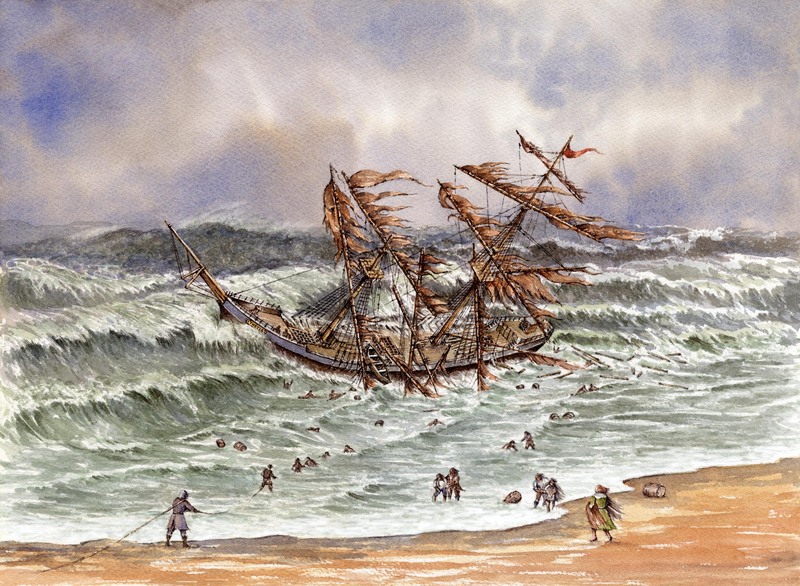 The two masts broke and some crew were swept overboard. Local people took survivors into their homes. During the salvage operation a stash of illicit tobacco was found deep in the hold and some crew were arrested for smuggling. Other casualties of Beale Bar included cargo steamers carrying sugar and coal to Limerick. This illustration was prepared for the Woodland Trust, who, along with the Belfast Hills Partnership and Newtownabbey Borough Council, care for and maintain for the various paths and ancient woodlands around Carnmoney Hill. 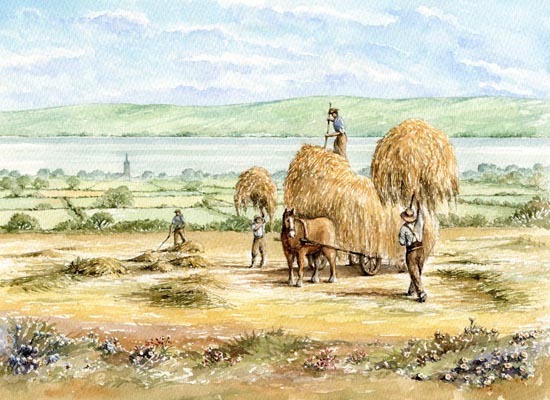 This illustration is based on an early 20th century photograph showing men cutting and gathering hay on the lower slopes of the hill. Belfast Lough can be seen in the background and this view, although much built up with the urbanisation of Newtownabbey, can still be identified from the pleasant walks through the 200 acres of parkland. It is likely that a Thompson family who lived in the farmhouse 40 years later were descendants of John Thompson. George Thompson, a farmer aged 41, is listed on the 1901 census return for Dunanney townland as the head of family with his wife Mary (40) along with four sons and a daughter aged between four and 16. Significantly perhaps, the eldest boy aged 16, and called John could be named after his paternal grandfather. Also living with the Thompson family are a nephew, Hugh Semple, a horse dealer aged 32 and Patrick Hamill, a 40-year-old servant whose occupation is given as farm labourer. The census describes the house as having “stone, brick or concrete” walls and a “slate, iron or tiled” roof. A second-class house, there were three windows in the front and six rooms were occupied. 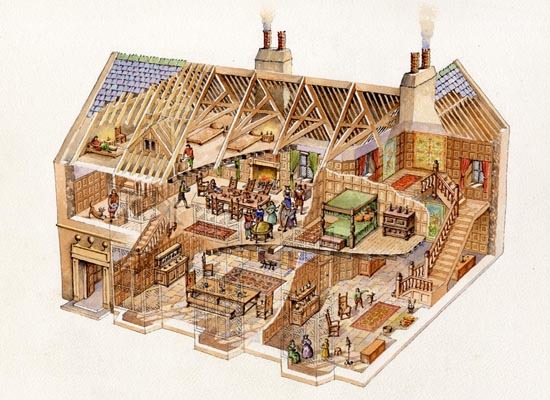 In addition the census notes nine outbuildings; a stable, harness room, cow house, piggery, fowl house, boiling house, barn, turf house and shed. Unfortunately the farm was destroyed when it burned down in the 1960s. Downpatrick Gaol opened in 1796. 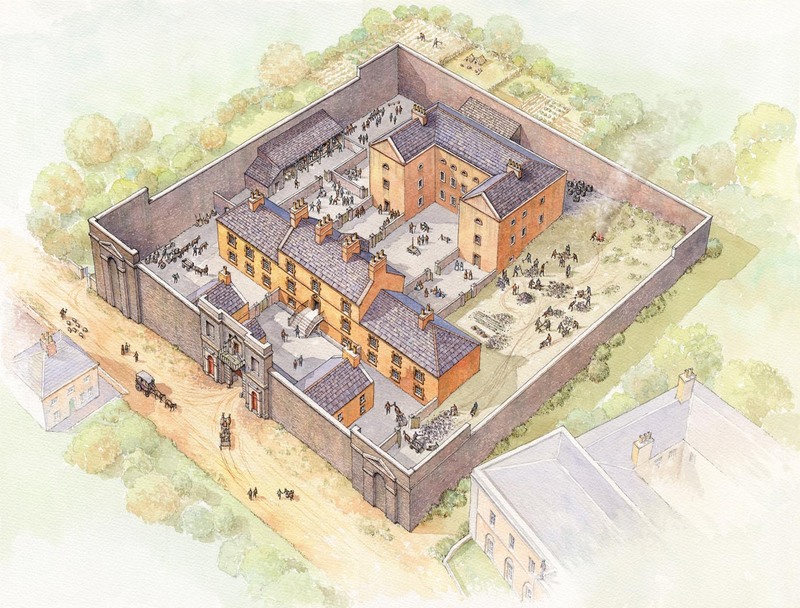 It was hoped that the new building would have none of the overcrowding associated with the old prison system and would be an important tool in the reformation of society. 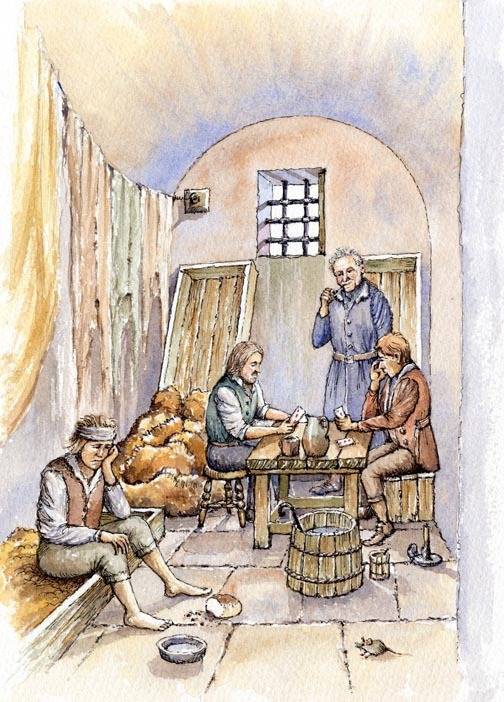 However the 1790s in Ireland were times of economic and political turmoil and the consequent rise in crime soon led to the Gaol being overcrowded and insufficient for the needs of the County. This view shows some of the conditions experienced in one of the cells. 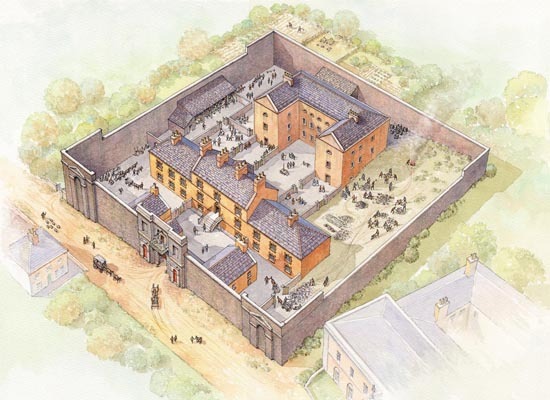 Downpatrick Gaol was to be modelled according to the recommendations of the penal reformer John Howard. The architect was Charles Lilly who also carried out work on Down Cathedral. 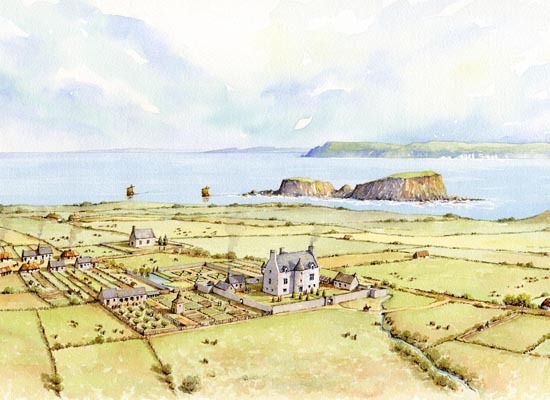 Little remains of Ballintoy Castle, but the name ‘The Castle’ is still used to refer to the area where it stood to the west of the present Harbour Road, near the Parish Church.The original castle was built by a family called Maelderig, who were later known as Darragh or Reid. However, in 1625 Randal MacDonnell, 1st Earl of Antrim, leased ‘the old townland called Ballintoy’, including the castle, to Archibald Stewart. 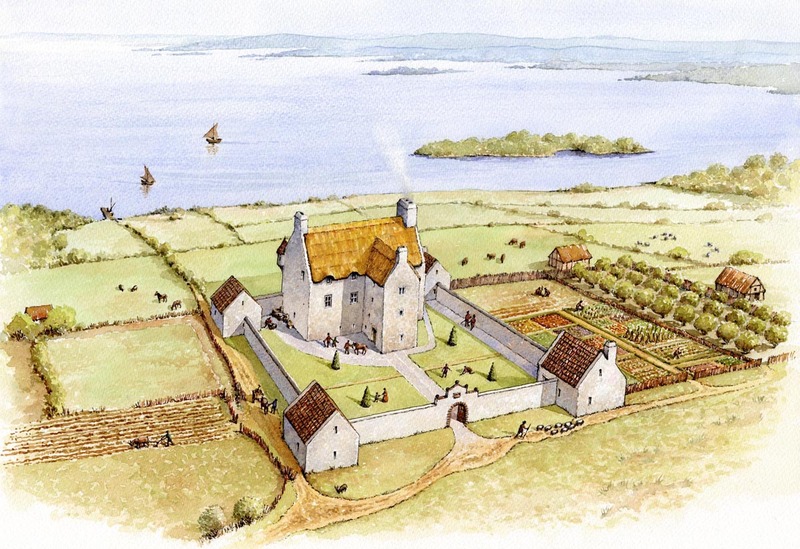 The Stewart family had come to north Antrim from the Isle of Bute around 1560. 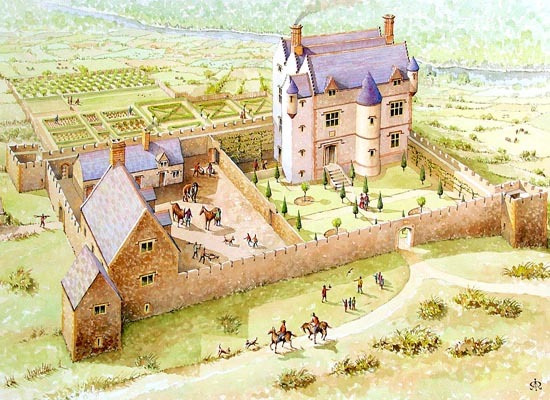 The castle, occupied and developed by the Stewarts, was a large fortified house surrounded by a high, defensive wall. It had outbuildings, gardens, a handsome fishpond, courtyards, yards and other enclosures. All of the walls were built with stone and lime mortar. 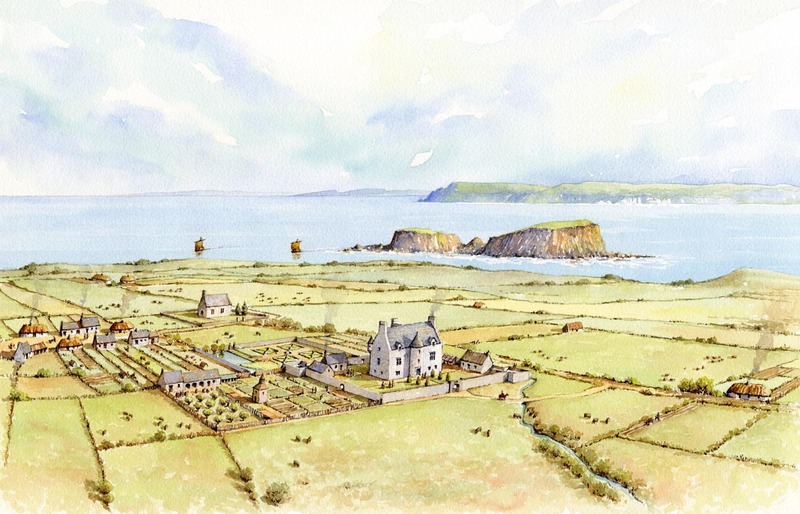 Situated beside the castle were the original village of Ballintoy and a church built by Archibald Stewart on the site where Ballintoy Parish Church now stands. 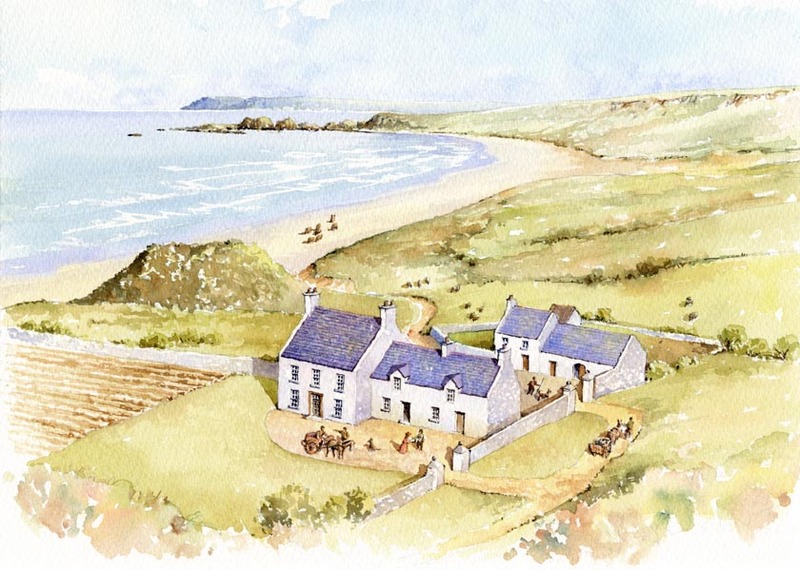 In 1759 Alexander Thomas Stewart sold the castle and his land in Ballintoy to a Mr Cupples from Belfast for £20,000. Cupples resold it almost immediately, for the same sum, to Dr Alexander Fullerton. One of his descendants, Downing Fullerton, pulled down the castle about 1800. The timber and other valuable materials were auctioned. By the 1830s all that survived of this once extensive building was a wall about 65 feet long. 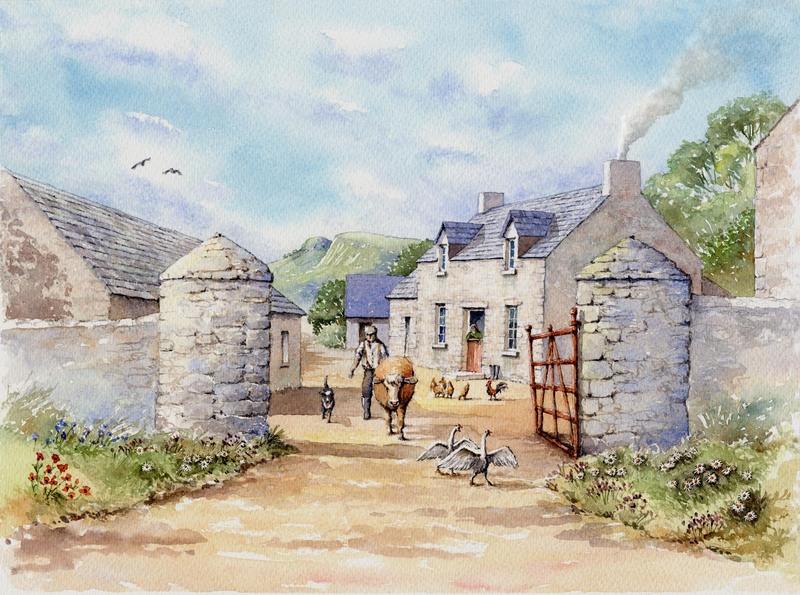 The outbuildings had been converted to dwelling houses and outhouses for the farmers who lived on the site. 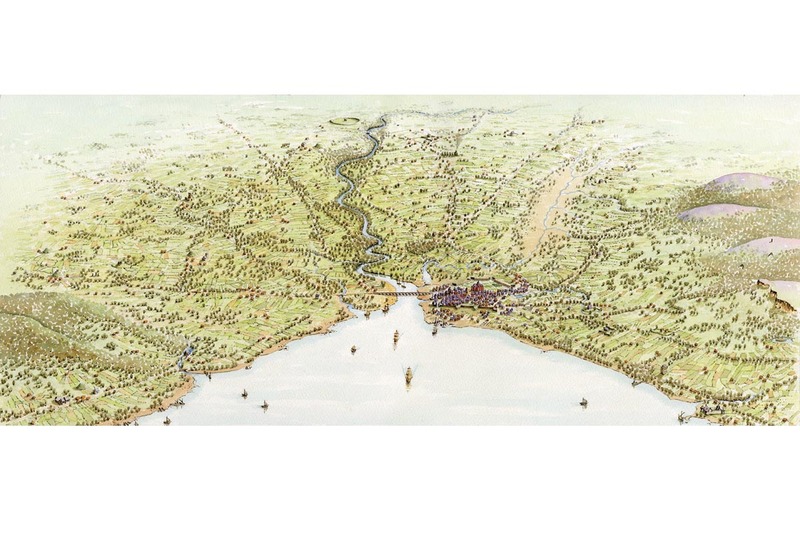 Between the 7 December 1688, when the apprentice boys shut the gates, and the 28 July 1689, when the relief ships docked at the ship quay, the city of Derry - since 1613 renamed Londonderry - had been surrounded by the Jacobite army. The siege lasted 105 days, during which the city was repeatedly pounded by artillary and much of it reduced to rubble and burnt-out buildings. Part of the mortar attack was carried out from Strong's orchard, this can be seen at the lower right. 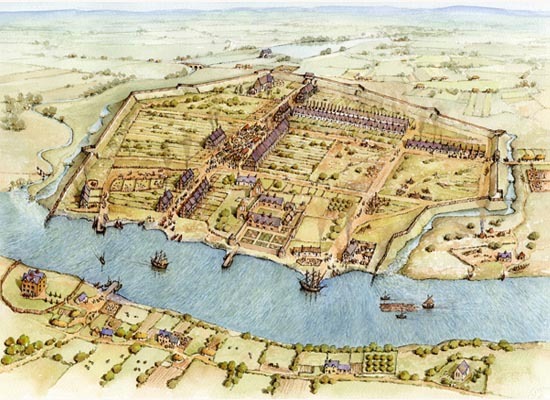 The Waterside is in the centre foreground, also destroyed by the occupying Jacobite forces. 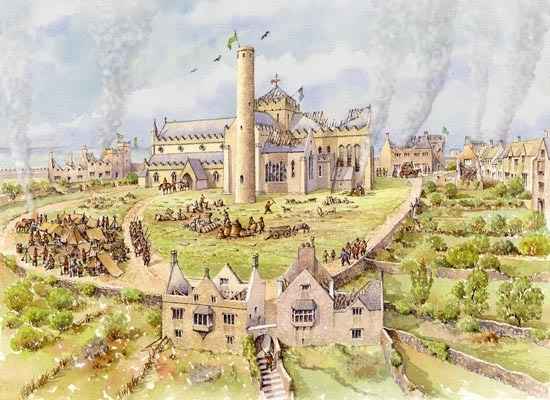 Just beyond the walled part of the city are the ruins of the Long Tower Church and to the left of this is Windmill Hill, where a number of skirmishes occurred. In the background are the main encampments of King James' army. 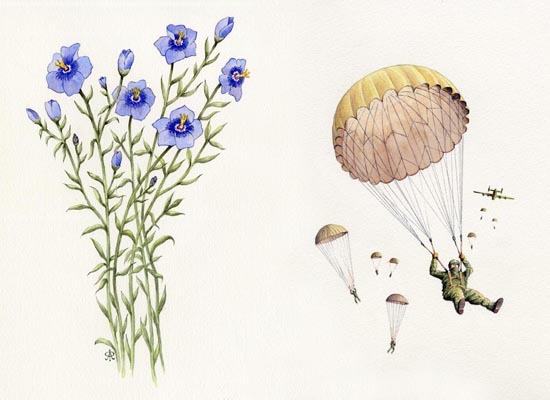 They left on 31 July after having lost over 8000 men. 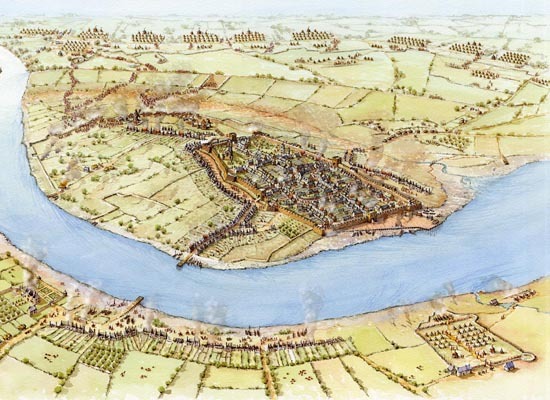 Over 3000 garrisoned soldiers and 7000 civilians died within Londonderry during the siege. The tranquil world of the Cathedral Close was engulfed in the religious wars that tore through Europe at the reformation. In the early years of the reformation, an English Protestant bishop of Ossory, John 'bilious' Bale, was famously cast out of Saint Canice's in 1553 by the staunchly Roman Catholic townsfolk. They had taken poorly to his sermons and the destruction of the statues of saints in the Cathedral. Then, during the 'Great Rebellion' of 1641 the Cathedral Close was sacked by Kilkenny's Catholic citizens; eye-witness accounts recorded that lead coffins of the dead were dug-up from graves to be melted down for shot. But far worse was to come in 1650 when Saint Canice's, then a headquarters of the independent Catholic government, was marked out for particular vengeance by Oliver Cromwell's attacking army. 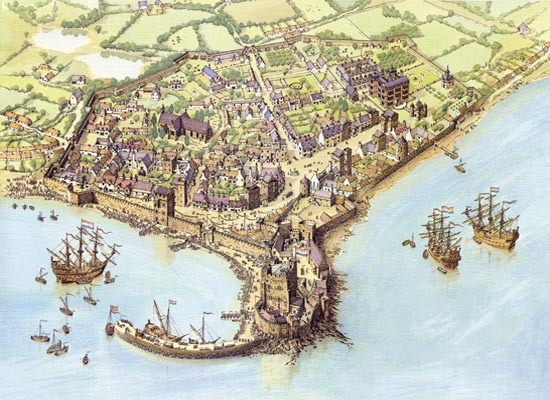 The plague-ridden Irishtown was overridden easily by Cromwell and the Cathedral Close was set upon with venom; the church was devastated and its famous tombs torn apart so that 'dogs knaw the bones of the dead'. These years began a period of slow attrition, which was not reversed until the mid-eighteenth century when a new, more gentrified, version of the Cathedral Close emerged. This is essentially the Close as it exists today. By the 19th century Talbot's Tower had become a relic of a more violent past. The once intimidating tower was now crowned with a small pleasure garden for the nearby dwelling house 'Rose Cottage'. 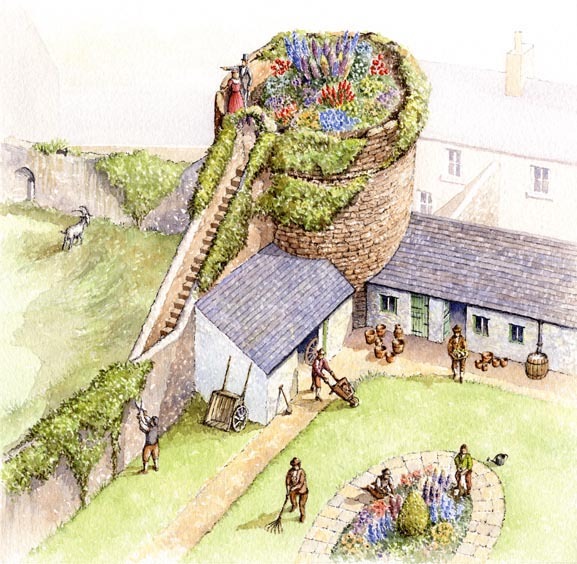 As the city walls were no longer needed for defensive purposes the town ditch was built over with sheds and outhouses which formed part of an ornamental garden at the rear of the adjacent cottage. In the 19th century several tonnes of soil were carried up the tower's steps to create a secluded garden high above the city streets. Fragments of wine bottles, clay tobacco-pipes, buttons and hairpins found in the garden during excavations show that it was well-used. A pet cat was also buried amongst the flowers. A number of .303 bullets and cases found on the roof of the tower during excavations suggest that the tower was used by snipers firing at Kilkenny Castle, a short distance to the North East, which was occupied by Republican soldiers directly before the Irish Civil War (1922-1923). At the west end of White Park Bay there stands a stone building, known as the Old Youth Hostel, and the ruins of two other stone structures. These are the remains of an extensive two-storey, slated mansion called White Park House, and its outbuildings. 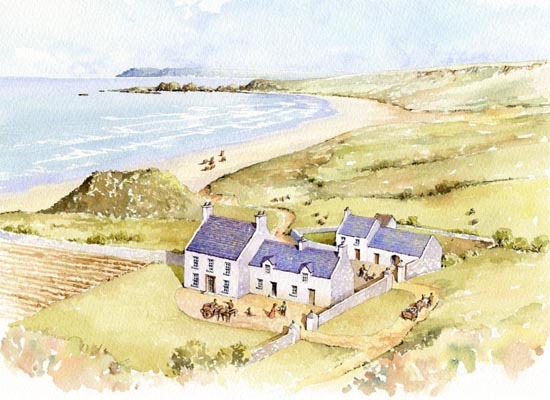 They were built around 1740 by Squire John Stewart, a member of the family that lived at the nearby Ballintoy Castle. White Park House was for some years the site of a school for the sons of the local gentry. They were taught by the Rev. William Sturrock, who was curate of Ballintoy Parish Church in 1772 and vicar of Culfeightrin Parish from 1770 to 1777. Members of the Stewart, Whealey and Macnaghten families received their early education at this school. There is a longstanding local tradition that the influential politician, Lord Castlereagh, was educated at the school prior to entering The Royal School, Armagh in 1777. It is not known when White Park House ceased to be used as a dwelling house or a school. By 1838 a section of the house was occupied by a Water Guard officer, who patrolled the coast to combat smuggling, but the other buildings were in ruins. An area near the site of the house is still known locally as the ‘balleleigh’. This may be a derivation of ball alley or bowling alley, and perhaps signifies a place where the pupils or residents of White Park House played a ball game. 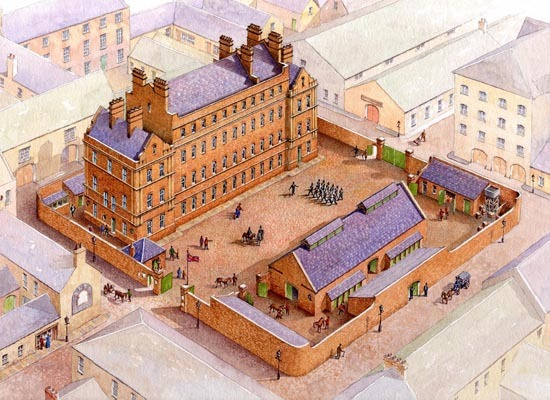 It is difficult to believe when looking at the site today that the gardens around Moira house were once among the most famous in Ireland. The great house here had been built in the early 1690s by Sir Arthur Rawdon (1662-1695), replacing an earlier house that his father Sir George Rawdon (1600-84) had built in 1651. As was typical of gentleman’s country houses of this era, the surrounding gardens were laid out in a rigidly geometric fashion incorporating lots of clipped hedges and tree lined vistas. 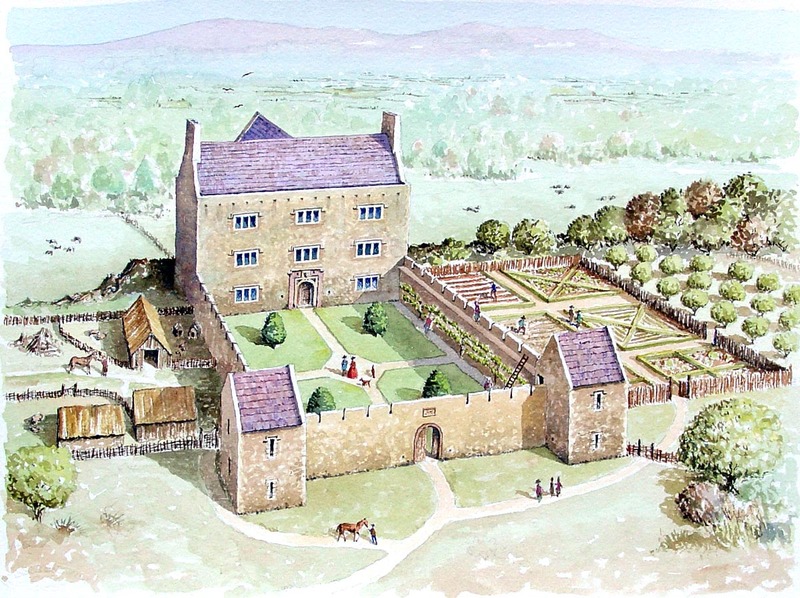 Features of Rawdon’s garden at Moira included parterres, a bowling green, orchards, a lavender lawn, a kitchen garden, a labyrinth, bosquets (formal groves), a wilderness (formal wood) and canals (ornamental ponds). A large stove or hothouse accommodated some of the plants that James Harlow had brought for Sir Arthur from Jamaica in April 1692; these included a shipment of 20 cases each with 50 plants, some seeds and a great many ferns. Sir Arthur, a friend of Hans Sloane (see the Ulster-Scots innovators on this web site), had a passion for plants and his large collection of rare and tender plants made Moira famous throughout the British Isles. After his death the gardens continued to be maintained and the house enlarged by his decendants until it was sold in 1778. 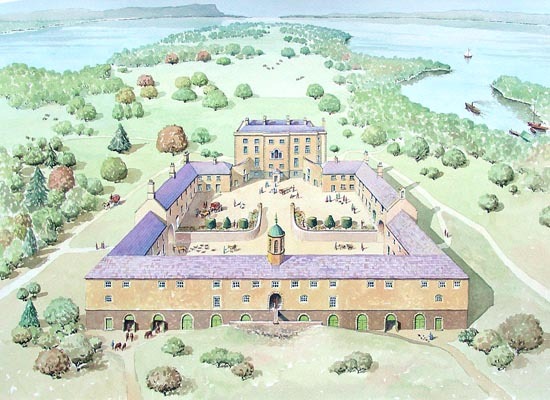 The building was demolished around 1800-10 and the neglected gardens gradually disappeared. Imposed in the early 16th century following the Reformation, the Penal Laws denied religious worship to all denominations outside the Anglican Church. These harsh, discriminatory prohibitions applied mainly to Roman Catholics but also affected Protestant dissenters such as Presbyterians. They not only denied freedom of worship but also banned intermarriage, serving in the armed forces, membership of professions, the judiciary and most public offices. 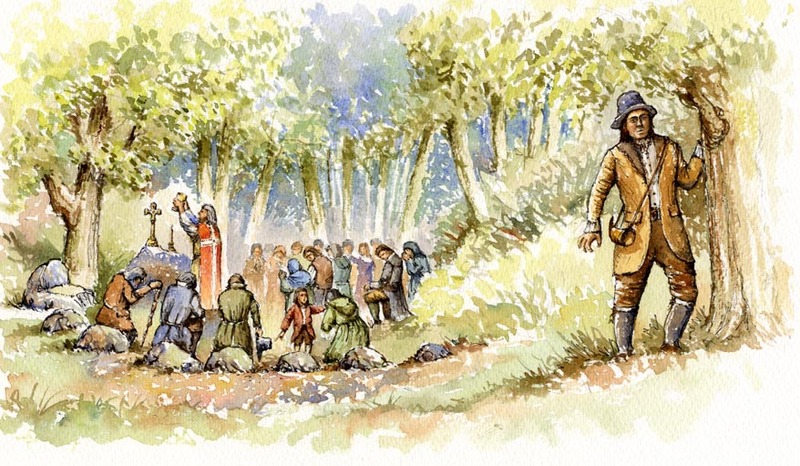 Much of the resentment caused by the early laws led to the rebellions of the 17th century and, following Oliver Cromwell's brutal conquest, many Catholic clergy were expelled and threatened with death if found. It was during this dark time that Catholic worshippers had to meet in secret, often outdoors where they couldn't be seen or heard. These places, known as 'mass rocks', were sometimes held in forests and one such site is shown here at Colin Glen near Belfast. Normally a lookout would be posted to warn the worshippers in case any Crown forces approached. He is equipped with a horn to sound the alarm. Many Protestants disapproved of the Penal Laws, especially Presbyterians. 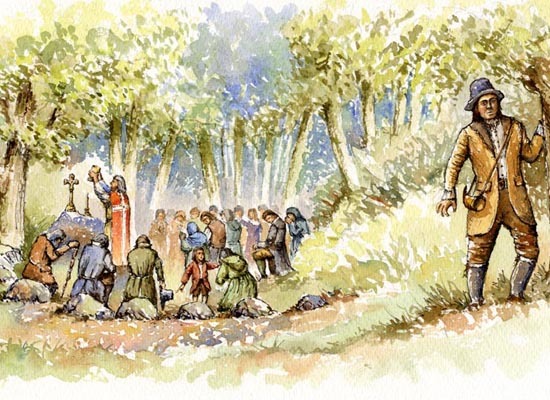 One such person was a kind woman called Belle Steele, who looked after the liturgical vessels used at the Colin Glen mass site. Opposition and reform in the late 18th century led to a relaxing of the laws, with emancipation finally occuring during the 1820's. 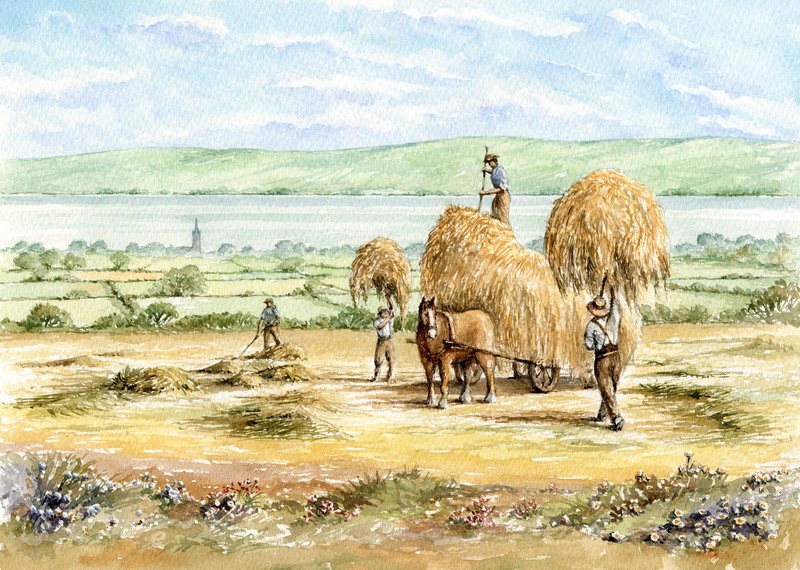 From early times lime has been a useful product in both building and farming. 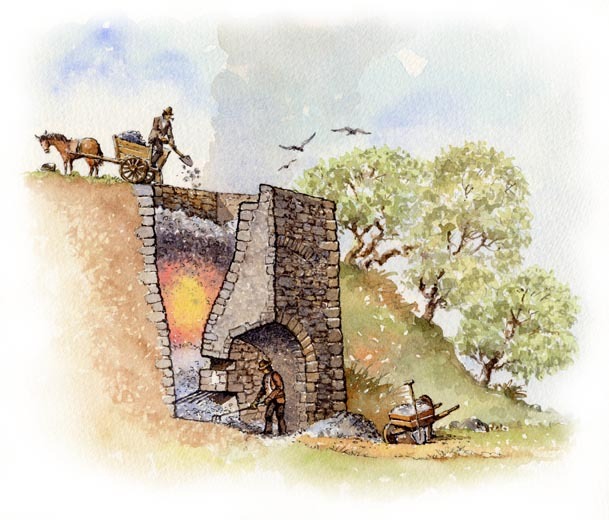 To produce lime, successive layers of a solid fuel such as coal, coke or wood and crushed limestone are built up within the tapered body of the structure. The layer of fuel at the bottom is lit using the draw hole and the kiln is left for several days, reaching temperatures around 900°C. The heat causes a chemical reaction to take place and the limestone (calcium carbonate) is converted to calcium oxide or 'quicklime'. Water is then added to this to form slaked lime, a consitituent of builder's mortar. 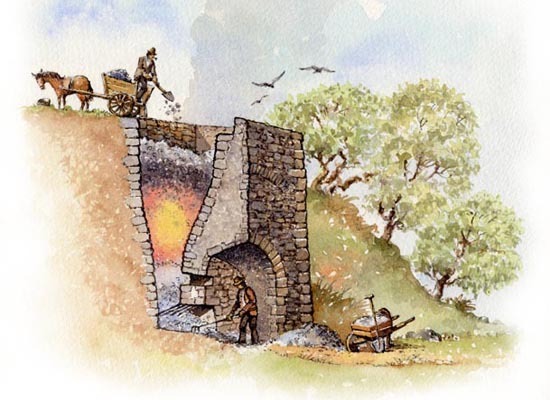 The kiln shown here is more for industrial production, being much larger than the smaller agricultural types. It has a viewing port to monitor the burning and the quicklime and ash is raked out through the throat into seperate piles. 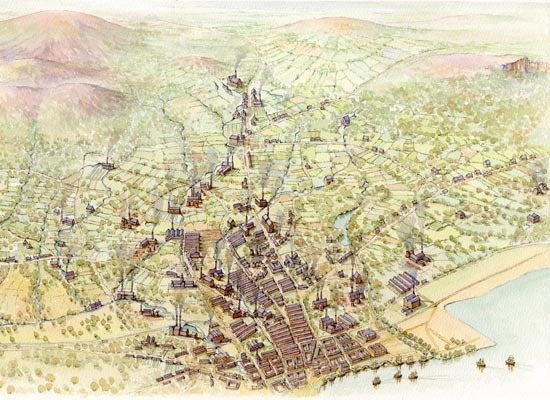 Settlement in Belfast existed from prehistoric times and it gradually grew to be a thriving port and merchant town in the 18th century. 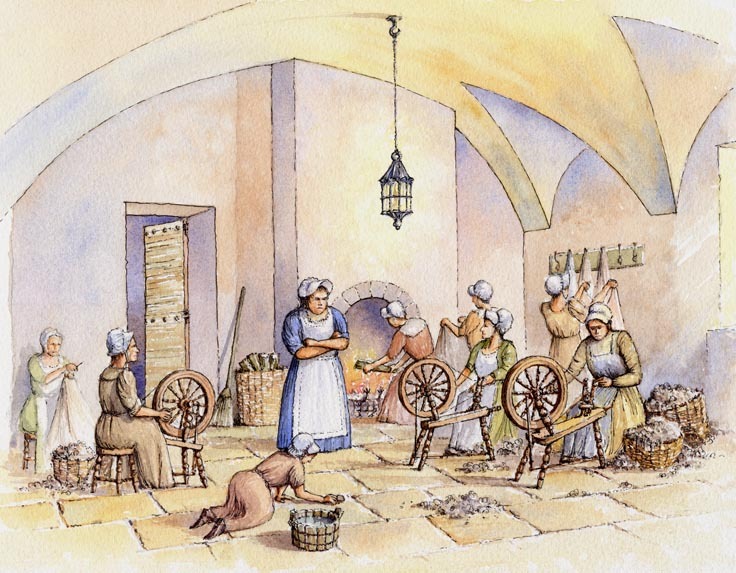 Apart from shipbuilding, the linen trade provided much of the industry and during the Industrial Revolution of the mid 19th century it was beginning to develop from a mainly rural based production to one of the largest global exporters. 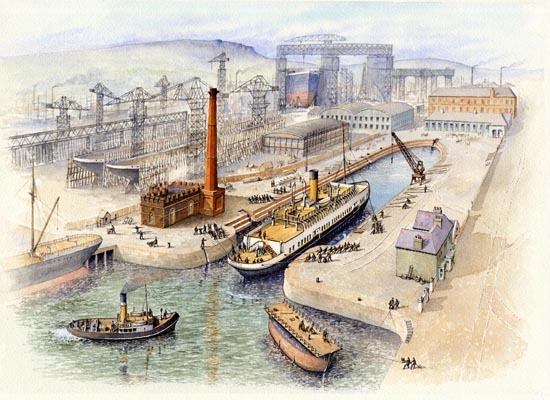 Much of the infrastructure was also built to support the linen trade, engineering, roads, housing, brickmaking as well as the other main exports - ships, tobacco and heavy engineering. Belfast rapidly expanded to become the major industrial city in Ireland and, as a consequence, the population proliferated due to migration from not just rural Ireland but also from Scotland and England. 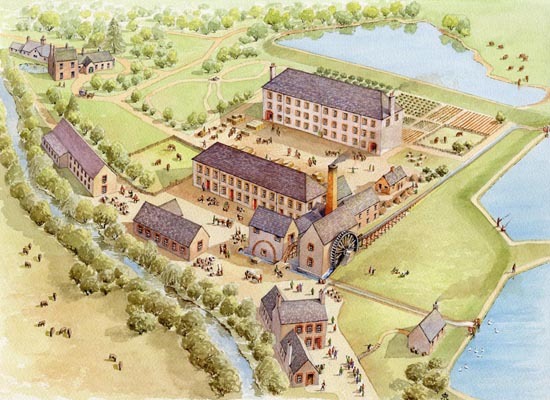 This aerial view shows the main mills and factories that were in production during the latter part of the 19th century and shows how the surrounding hills and the many rivers contributed to the production of linen. Coleraine (meaning the 'nook of ferns') was developed during the Ulster Plantation in the early 17th century. At a time when many plantation settlements had to be fortified, the town was planned on a grid street plan surrounded by high earthen banks and ramparts. These earthworks have now disappeared however the modern street plan still echoes the early arrangement. 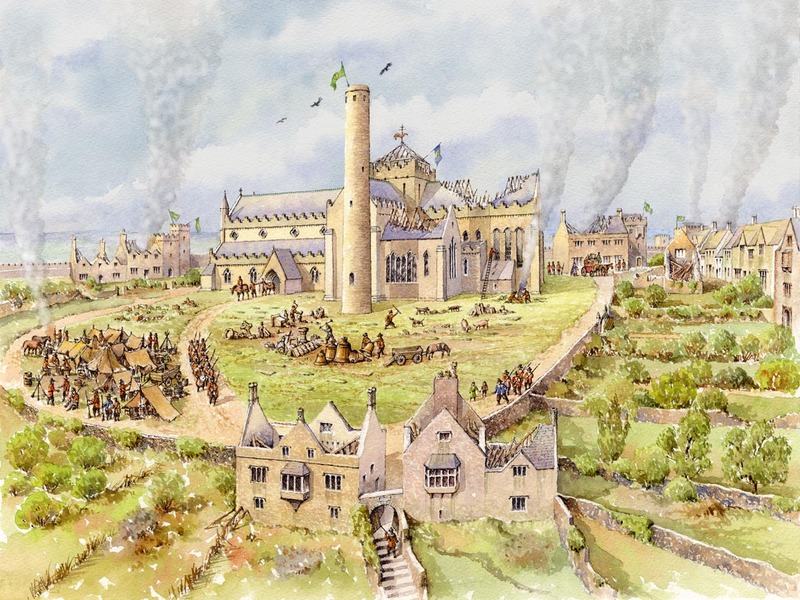 St Patricks church is in the top centre with the old Abbey in the centre of the illustration. 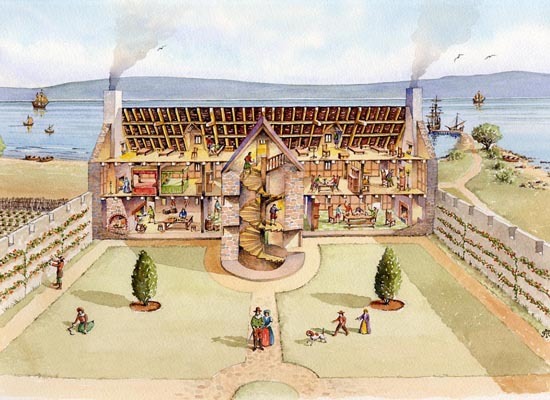 The houses were mostly timber framed but sadly none of the original dwellings are known to have survived. 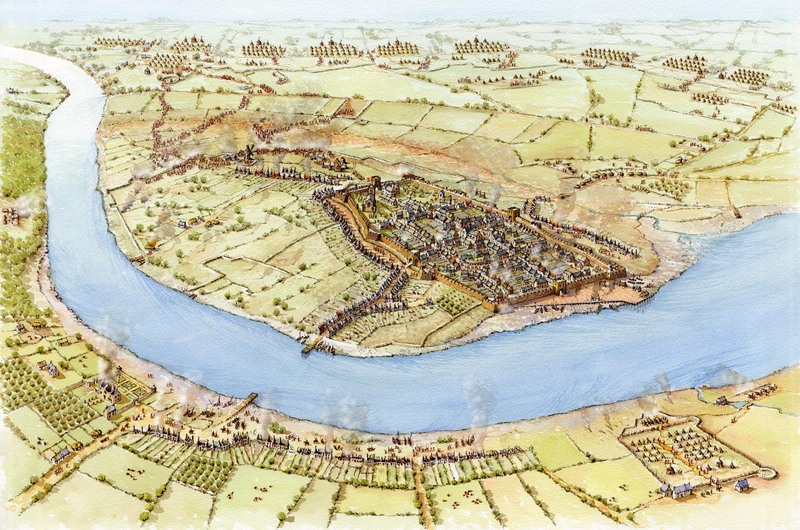 Several settlements occupied Castle Hill in Dungannon, from an early hill fort, then a stone Gaelic castle at the epicentre of the Ulster O'Neill lordship. 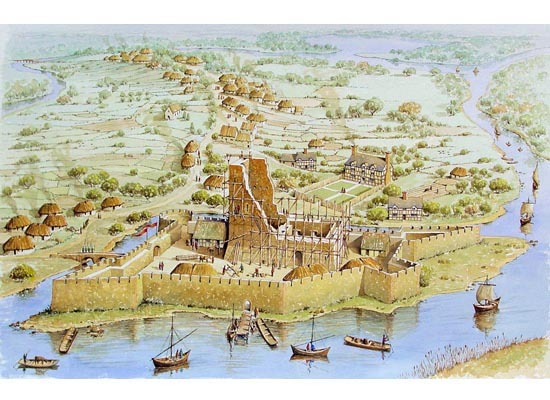 This was eventually followed by a bawned fortress built in the early 17th century by Arthur Chichester. 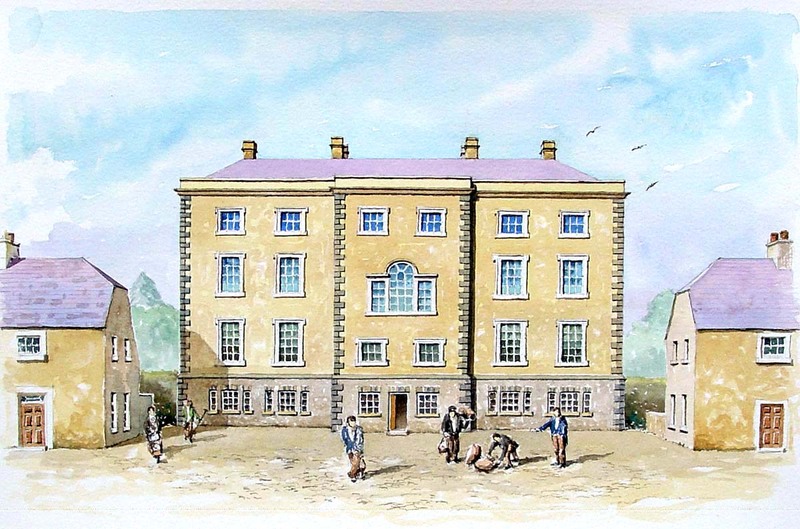 In the late 18th century some semblance of peace had reached Ulster and a Thomas Knox (later renamed Knox-Hannyngton) built an unfortified 'gentleman's residence' on the site. However, the house was abandoned in the late 19th century and allowed to crumble into what we see today. In a attempt to recreate this with the help of Terence Reeves-Smyth of the NIEA, I used an old 19th century drawing and early OS maps. This view is from a second floor window looking over the garden. The SS Nomadic was built by the Harland and Wolff shipyard in Belfast in 1911 around the same time as its famous relative RMS Titanic. It was to be used to ferry passengers from Cherbourg in France to the Titanic for onward travel to New York. She spent her life in Cherbourg and served during both world wars as a tender and a mine sweeper. She was retired in the 1960's but thankfully not scrapped. In 2006 she was purchased by the NI government and faithfully restored to her former glory. She now sits in the Hamilton Dock in Belfast, from where she was originally launched. This illustration shows her launch with the Titanic still under construction in the background. 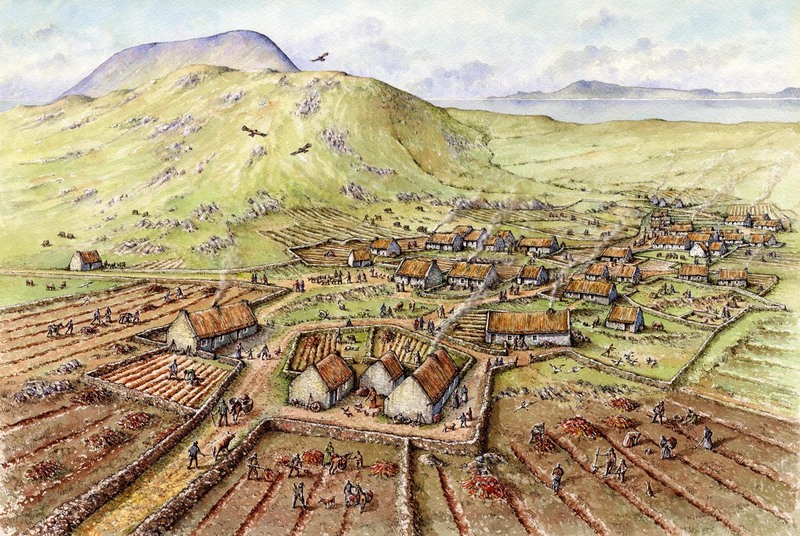 Ballyaghagan Cashel featured recently in a 'Big Dig' project managed by the Belfast Hills Partnership and Queens University, Belfast. It involved a community excavation with more than 400 people actively participating at the site on the Upper Hightown Road. No work had ever been carried out on the site before and initially it was thought to be a straightforward cashel, a circular stone enclosure dating to the Early Christian period (c500-1000AD). 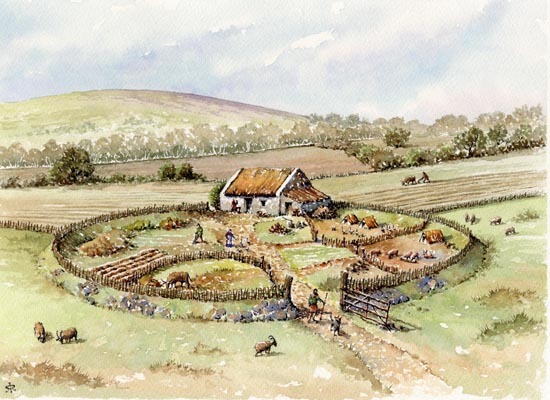 This reconstruction of c1650 shows the continued use of the enclosure as a small hill farm with a cottage, the remains of which are still visible today. 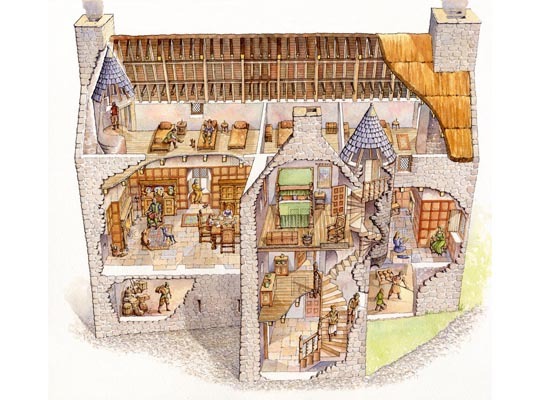 The 17th century Manor House is the most impressive building at Dunluce castle. It was built by Randal MacDonnell for his wife Catherine Manners. Being the widow of the Duke of Buckingham, Randal clearly wanted to provide a measure of comfort she was accustomed to. 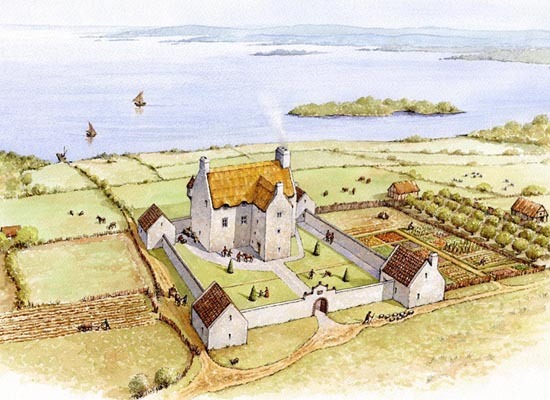 Catherine was not entirely happy with living on the rock and within five years had taken up residence in a new house on the mainland! Dunluce castle with its iconic coastal profile is perhaps only second to the Giants Causeway in the list of Northern Ireland images. Only recently has there been mention of the extensive town associated with this site. 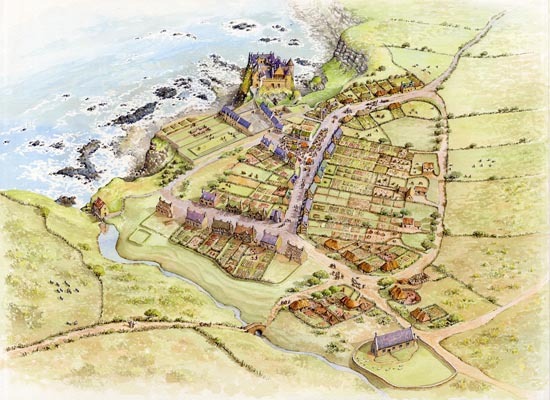 It was established in 1608 by Randal MacDonnell, the first Earl of Antrim but its existence was to be short lived. 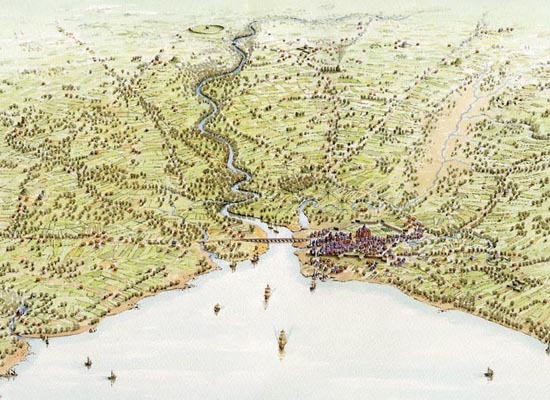 In 1641 the town was totally destroyed and was finally abandoned in the 1680s. Over the next two centuries the houses and streets were slowly buried and grassed over, with all above ground traces of the settlement gone by the 1860s. In 2009 the first of the footings of the individual merchants houses were exposed along with impressive street cobbling and drainage. 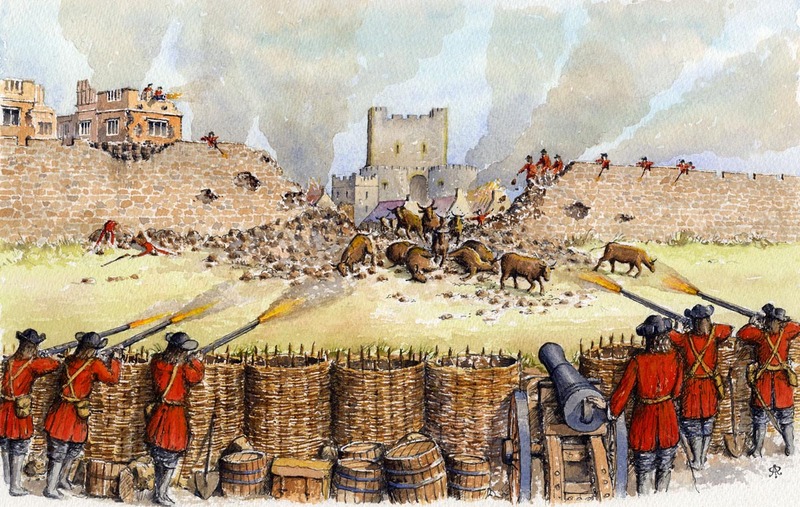 During the turbulent 17th century the walls of Carrickfergus were put to the test on a number of occasions, none the least being the siege of the Jacobite garrison in 1689 by King William's General Schomberg. The walls were breached by Schomberg's cannon in several places, the one shown here was between the North Gate and the north east bastion. 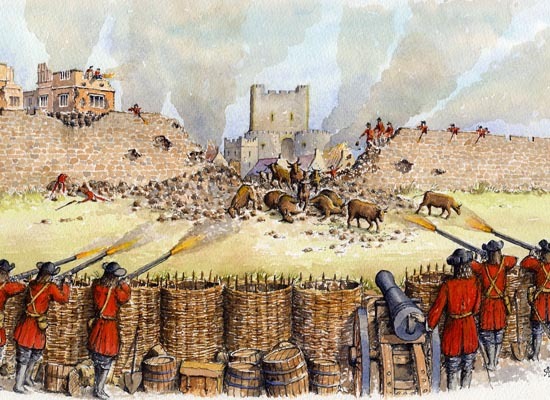 The garrison attempted to repair the breach and at one point they drove cattle over the rubble - some of which got killed in the musket fire. Stones and timber were then thrown over the bodies and a makeshift plug of the breach was made. Nevertheless this was only temporary as the town fell to the Williamite forces within a week. 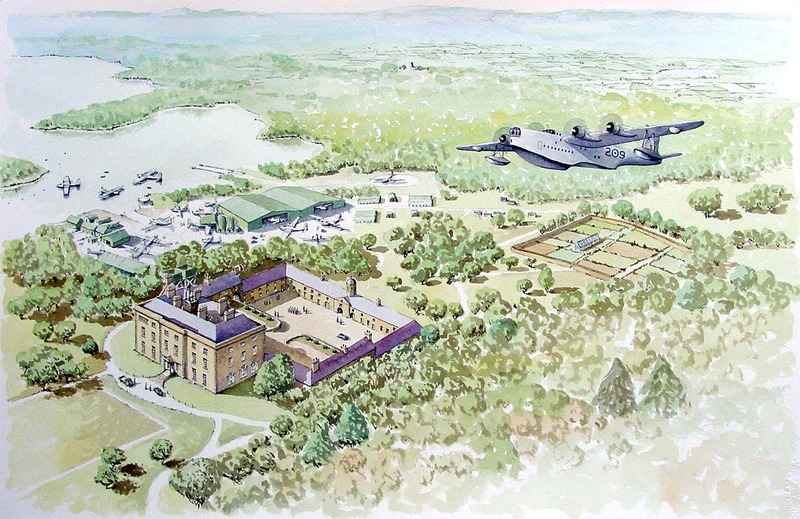 Chichester's Joymount house, badly damaged during the siege, can be seen on the left. It was finally demolished in 1768. 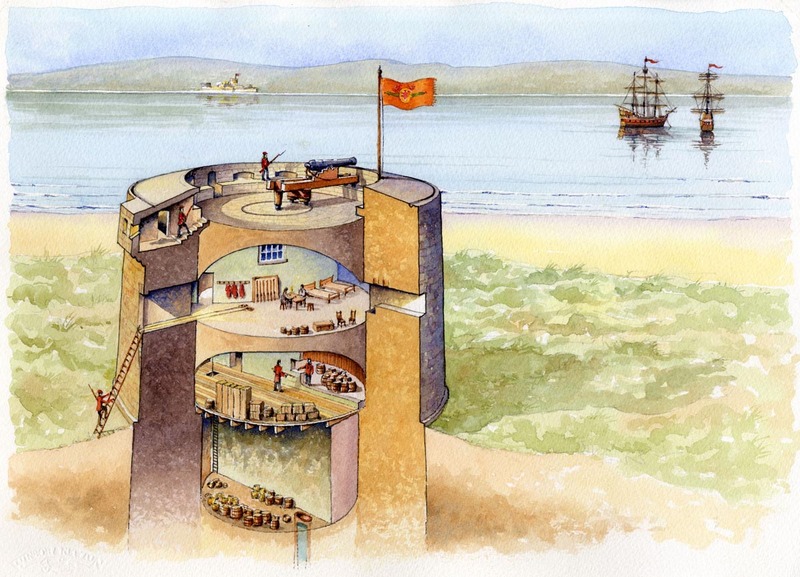 Martello towers were built around 1810-1812 to resist the threat of a Napoleonic invasion. They sprung up all over the world in a very quick period of time but nevertheless were very strongly built. Magilligan has massive walls 4m thick in places to withstand the pounding of cannon and also to support its own 24 pounder on top. Ironically Martellos were never used as the threat had passed by the time they had been built. 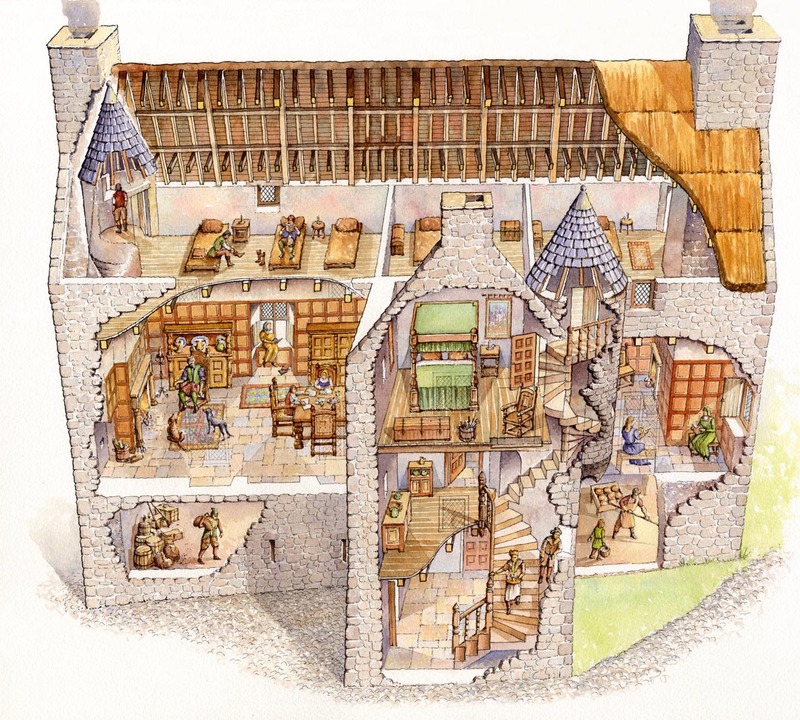 The interior has three storeys with the ground floor serving as the magazine and storerooms. 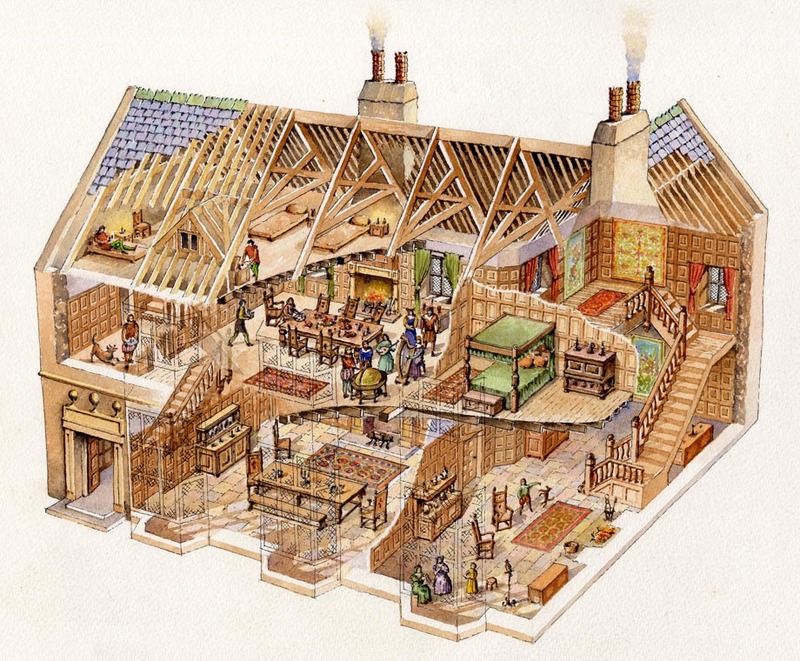 The garrison of 24 men and one officer lived on the first floor, which was divided into several rooms and had fireplaces built into the walls for cooking and heating. The officer and men lived in separate rooms of almost equal size accessable by means of a ladder which could be drawn up during an attack. 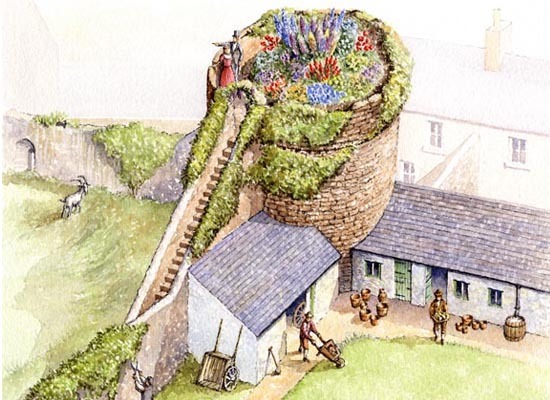 A well in the basement supplied the garrison with water however an ingenious drainage system linked to the roof enabled rainwater to refill the cistern. Having spent my childhood in this area I remember the White House as a ruin housing a gospel hall. The White House Preservation Trust was set up to manage the preservation of the building, considered to be the oldest in Newtownabbey. 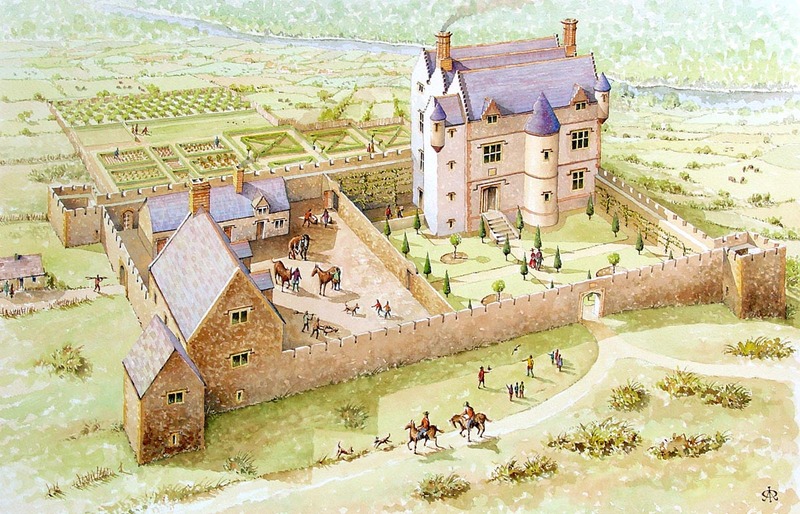 In 2006 it appeared as a candidate for the BBC Restoration programme and, although failing to win top place, nevertheless gained so much publicity that funding was eventually provided to restore the ruin and house a permanent exhibition to the Williamite/Jacobite Wars in Ireland and to create a historical and community centre for the area. Well done Whitehouse - you're looking much better! This view shows the building with its bawn and entrance from the Shore Road with the Cave Hill in the background. 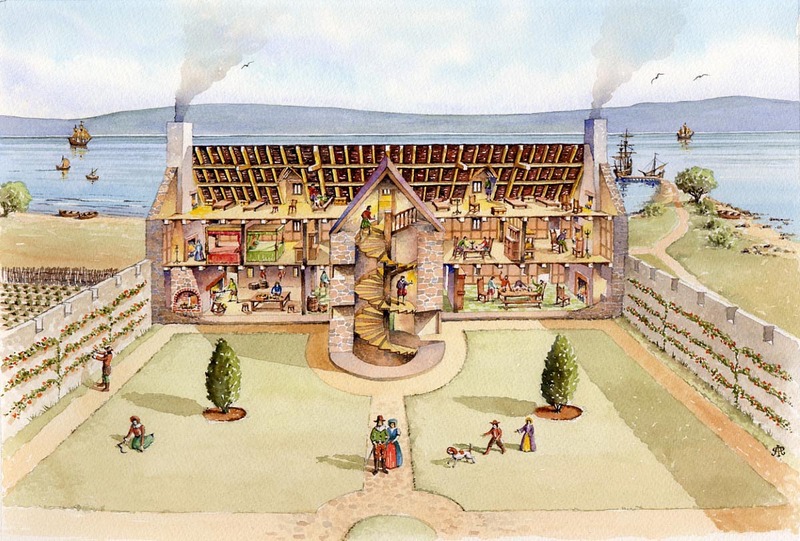 This view shows what the house would have looked like inside with the central staircase, kitchen, hall and bedrooms. A small formal lawn and planting occupies the bawn and a jetty where some famous visitors arrived is in the background! 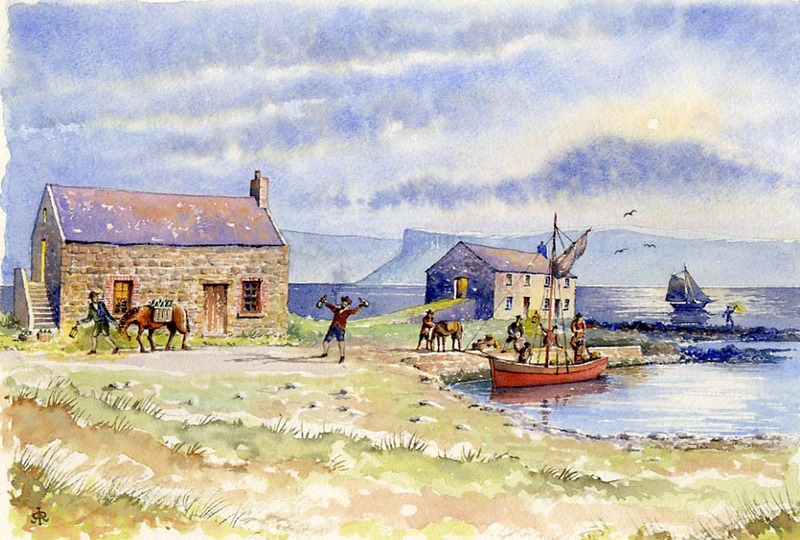 Being a small island between Scotland and Ireland, Rathlin was ideally placed for smuggling with poteen, rum, brandy, tobacco, lace and other products being shipped in and out on a regular basis. Ushet is a small harbour on the south east of the island with a few convenient buildings. The one on the left (known as the Smuggler's House) had false walls, said to be used for concealing the contraband. 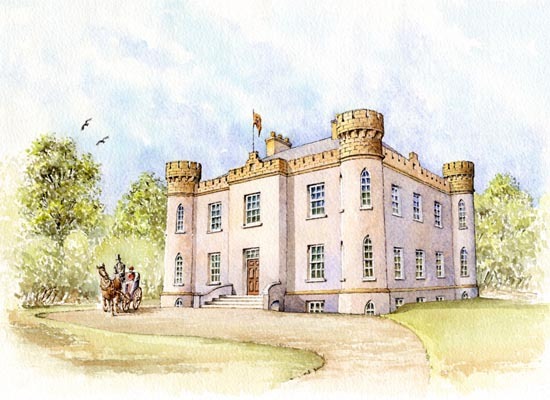 Newtownstewart castle was built in 1619 by Sir Robert Newcomen at the time of the Ulster 'plantation'. 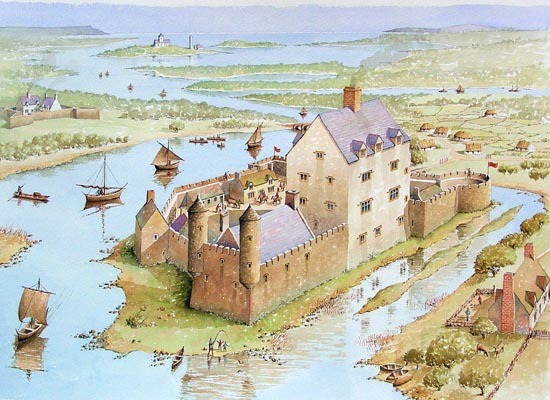 William Stewart from Newtownstewart in Dumfries and Galloway purchased the castle in 1629 and renamed it and the fledgeling town after his home town. 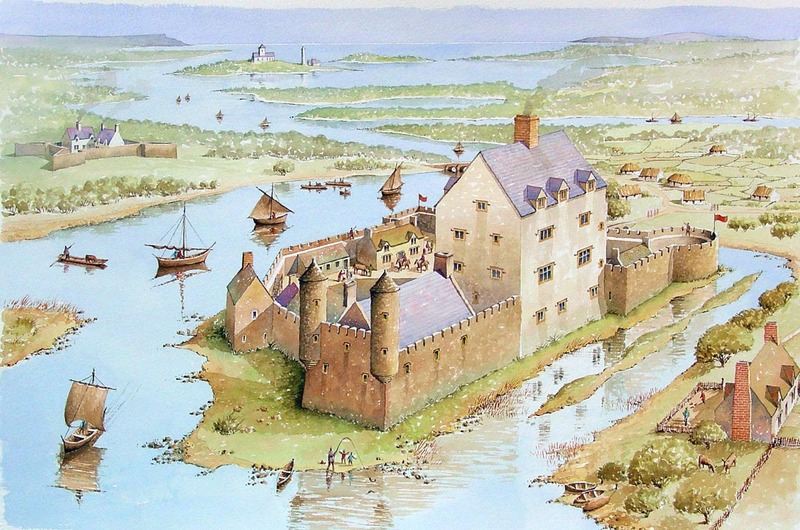 The castle was attacked by Phelim O’Neill during the 1641 rebellion and again in 1689 by the retreating King James. Built in 1893 for the Royal Irish Constabulary following a period of serious rioting (things never change!) 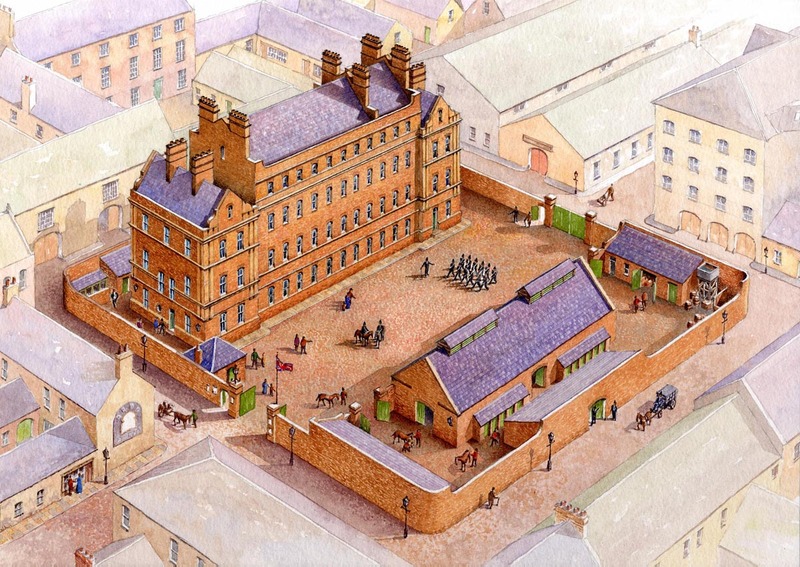 this purpose built station in the centre of Belfast had its own stables, gatehouse and a central parade yard. Believed to have been the oldest operational police station in Europe it has now sadly been demolished. Replaced by a functional but characterless carbuncle. 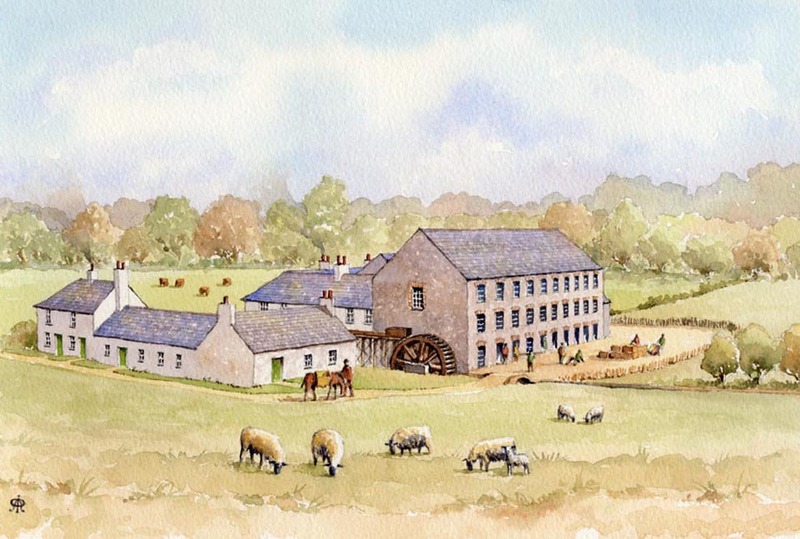 In 2009 I was commissioned by Newtownabbey Borough Council to prepare a number of illustrations for the new museum, to be housed at their main offices at Mossley Mill. Some of these images were to show how the site developed from a simple cotton mill in the 18th century to the extensive linen establishment of the 19th and early 20th centuries. 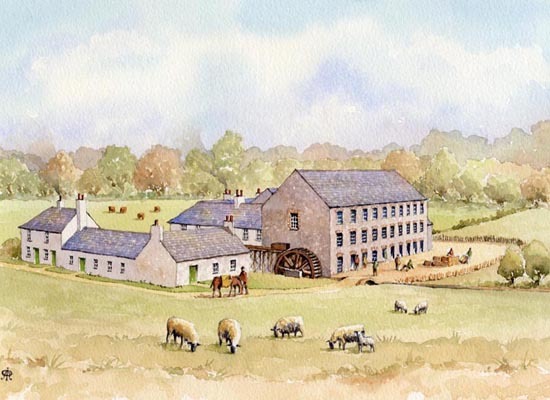 This illustration shows the linen mill c1835 when it was still water powered. 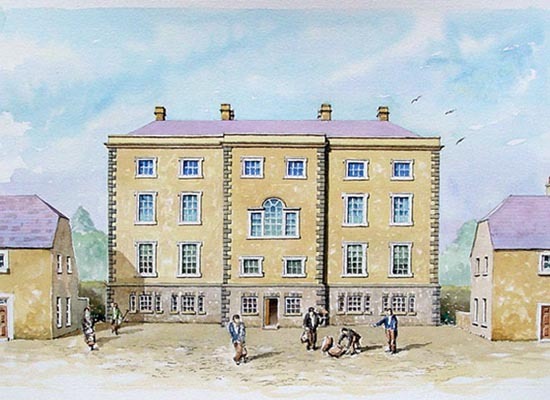 The house at the top left is Mossley House, where Edmund Grimshaw, the mill owner, lived with his family. The large 3-storey building at the top right still survives. 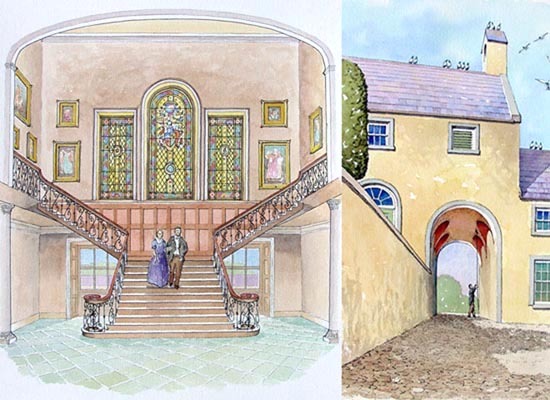 n 2009 I was commissioned by Newtownabbey Borough Council to prepare a number of illustrations for the new museum, to be housed at their main offices at Mossley Mill. 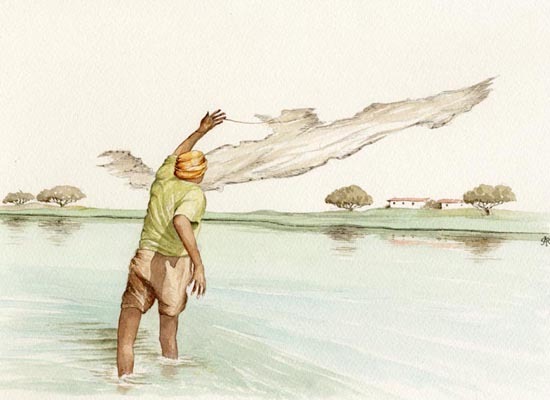 Most people think of tablecloths when considering linen however it was one of the strongest and most durable fabrics of its day, with gill fishing nets as one of the products in its long list of uses. This illustration shows a rather obscure connection with a 1950's Buick. 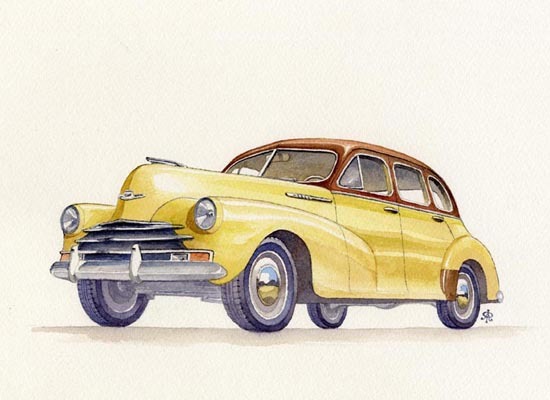 Most people think of tablecloths when considering linen however it was one of the strongest and most durable fabrics of its day, with seat belts as one of the products in its long list of uses. 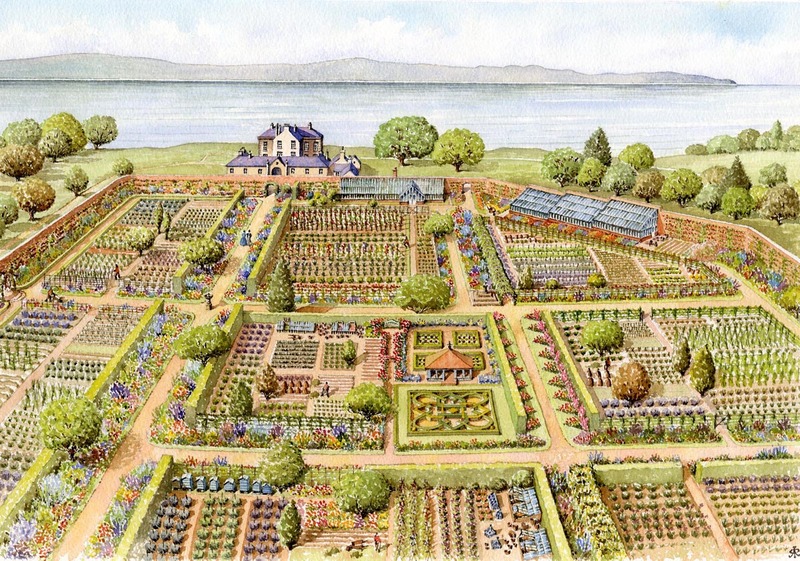 In 2011 I was asked to illustrate the Crawfordsburn walled garden as it was in its heyday during the late Victorian and early Edwardian periods. The garden provided walks for the family, cut flowers for the house, vegetables and soft fruit for the table and employment for a team of gardeners. 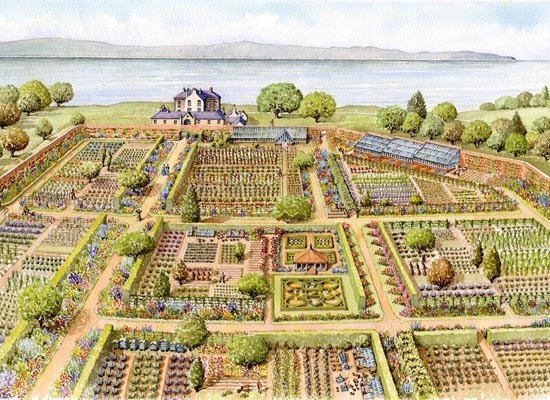 Other features seen here are the large greenhouses, beehives, a knot garden and a Laburnum arch. This illustration shows the attractive flax plant, from which linen was made. Most people think of tablecloths when considering linen however it was one of the strongest and most durable fabrics of its day, with parachutes as one of the products in its long list of uses. 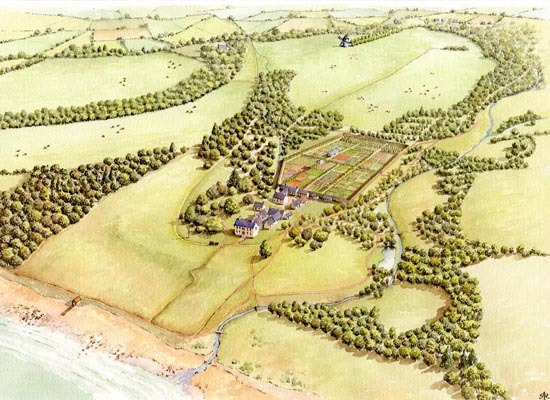 Crawfordsburn estate was purchased from Lord Clanbrassil in the late 17th century by William Crawford. 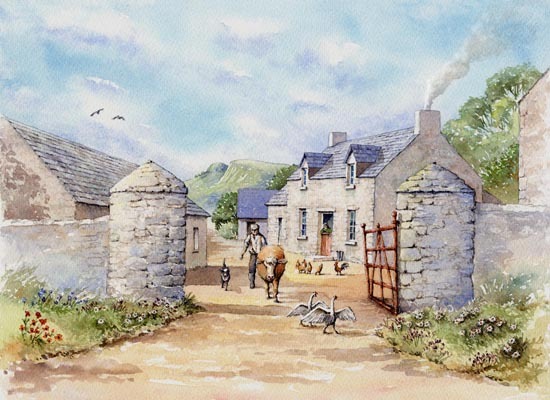 The house was modified on several occasions during the 18th and 19th century and with the help of a photograph and early OS maps I was able to recreate the estate c1830 with the help of Terence Reeves-Smyth of the NIEA. Nothing now rermains of the original house, demolished to make way for the present building of 1906. 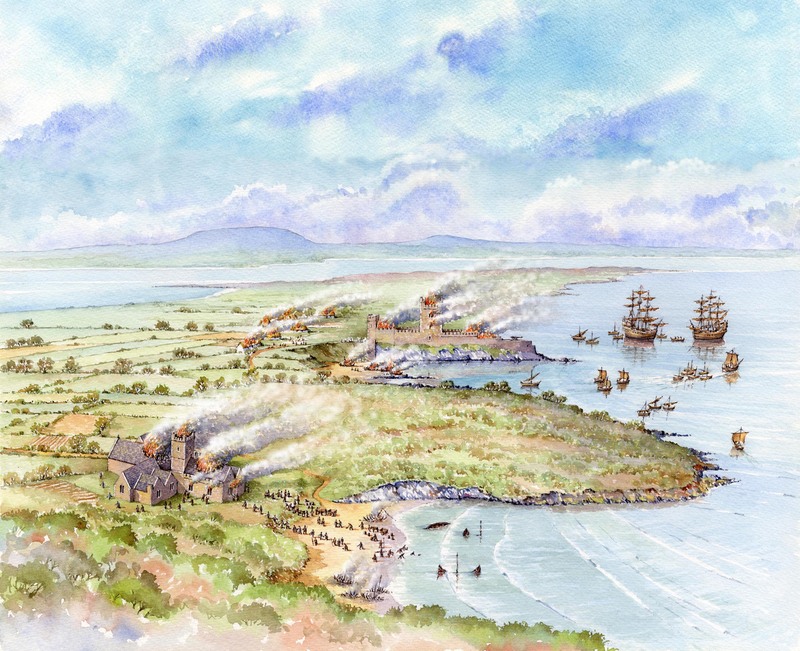 This illustration was painted in my earlier style to commemorate 300 years since the landing of King William III at Carrickfergus in 1690. It shows all the features still evident today - the castle, the walls, St Nicholas' church and some that have mostly disappeared such as Joymount house, the tower houses in High Street, the Water and West Gates. The townsfolk are out in force to give King Billy a right royal welcome! 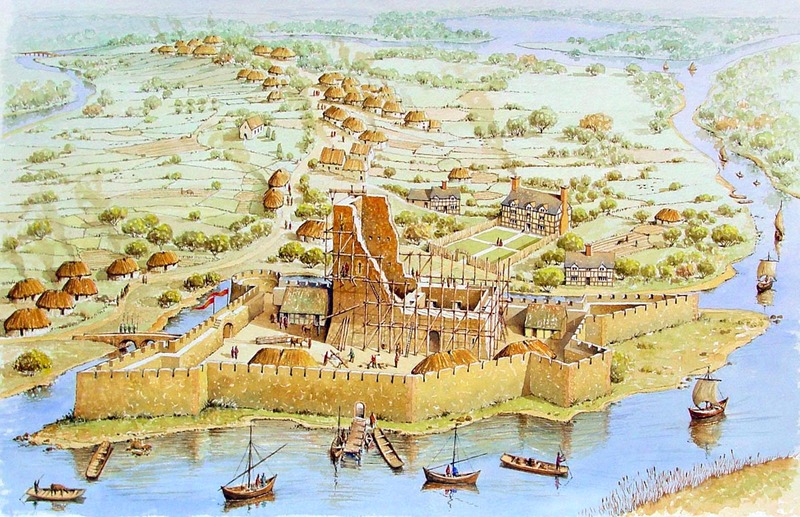 By this time Belfast was an important walled town, was even building ships and was connected to the east bank of the Lagan by an impressive bridge. 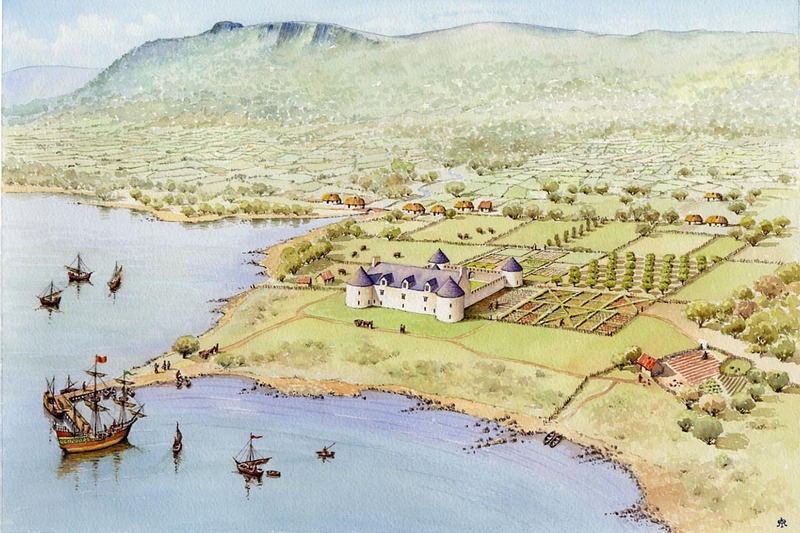 Other small castles had been built at Greencastle, Castlereagh, Fortwilliam and Whitehouse and the field systems had developed into what we see today. The village of Ballynure once boasted several mills including the cotton spinning mill. 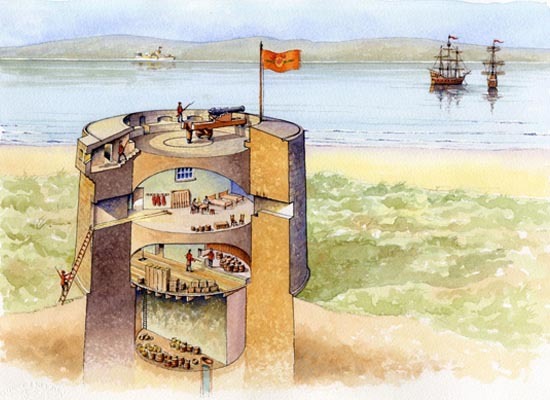 Its machinery was described as consisting of 9,600 mule spindles propelled by a metal breast water wheel 28 feet in diameter and 4 feet 6 inches broad, having a fall of water of 30 feet. 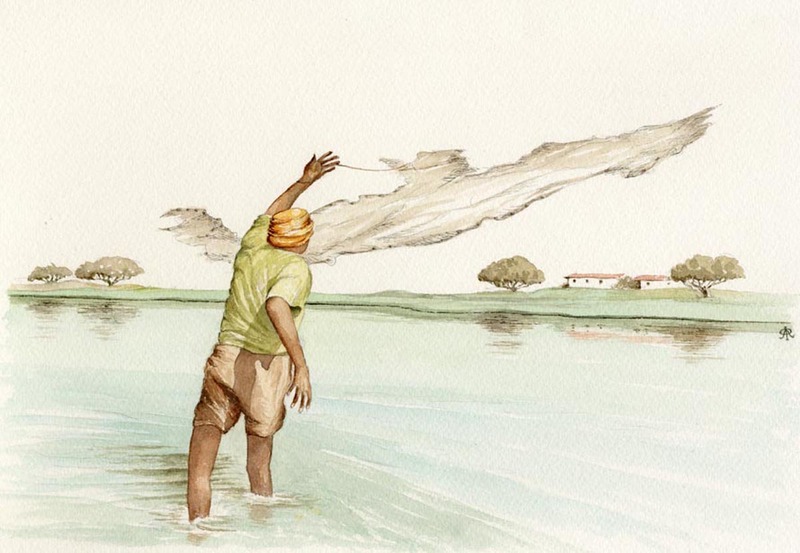 The supply of water was derived partly from the stream on which the mill is situated and partly from the united contribution of numerous rivulets which are collected in a large dam. An early account adds "From this the water is conveyed, occasionally by the channel of the stream and sometimes by cuts leading it into dams, for the supply of trifling mills along its banks. By these means it is rendered abundant in all seasons. The water wheel is of 24 horsepower." The mill is still standing today and can be viewed clearly from the Church Road. 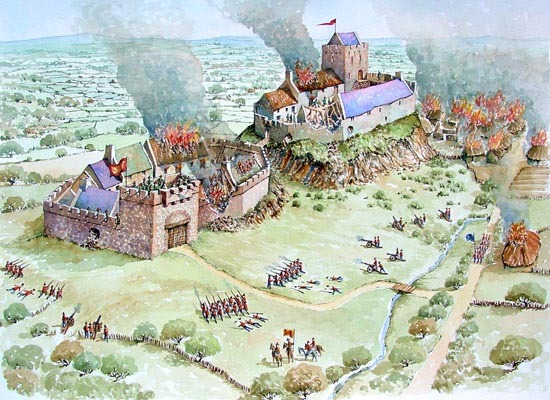 Following a further turbulent period in the area, the castle is besieged and attacked by Cromwells army. Subsequent destruction, mostly by quarrying in the 19th and 20th century have all but obliterated the castle. 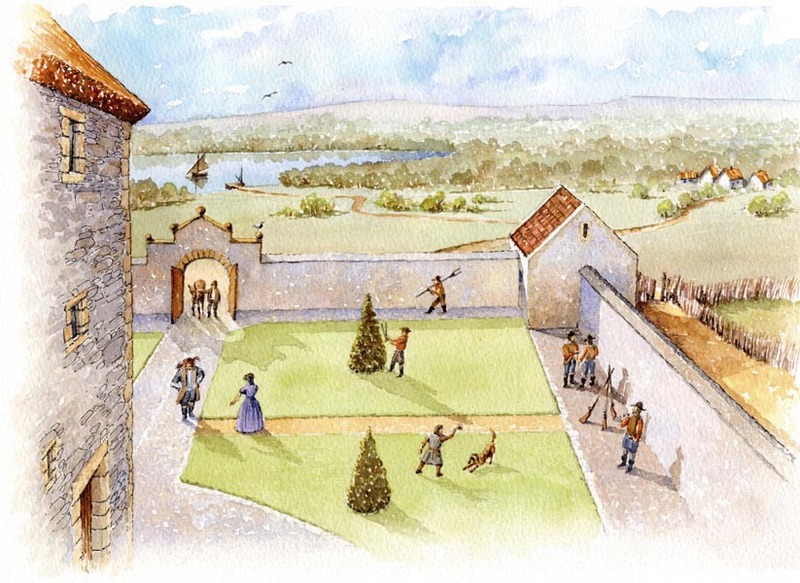 These illustrations were prepared to give visitors to Castle Archdale Country Park an idea as to how the estate once looked. This view shows the esate in its heyday - round about the 1870's. A small wing had been added to the north side of the house and also semicircular wings, to connect to the staff quarters. The large Paladian window was fitted with staned glass by this time - some of these panes are preserved in the present museum. The gardens were laid out informally and the family owned a small steam yacht for cruising on Lough Erne. The staircase at Castle Archdale was removed when the house was demolished but fortunately part of it was relocated within the stable complex, so is still visible today. 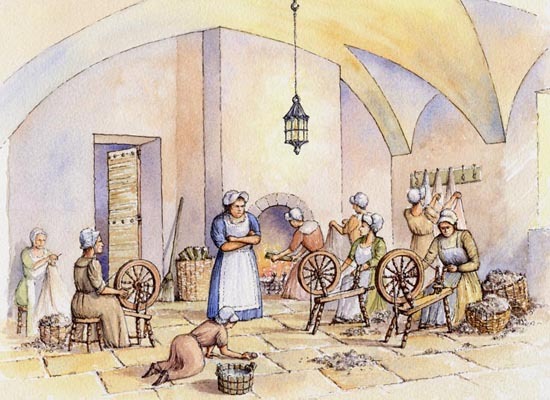 The buildings on the north side of the quadrangle also housed a dovecot - where pigeons were bred for food. Above the dovecot is a small belfry - disguised as a chimney, where a bell ringer would have called the staff to wok each day! 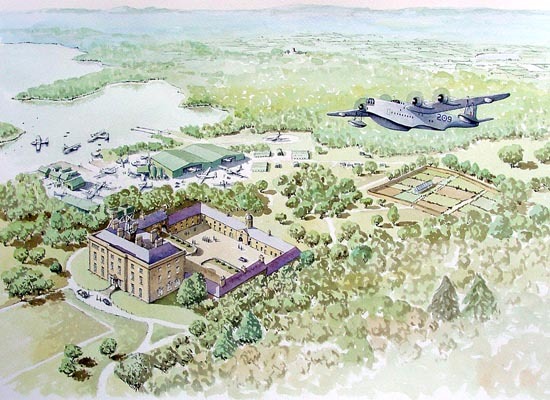 The castle became a Royal Air Force base during the second world war and played an important role, particulary during the battle of the Atlantic. Catalina and Sunderland flying boats were based at the castle at this time. The original 17th century plantation castle is now mostly ruined however the remains point to there being a three storey 'T' shaped building with a rectangular bawn. 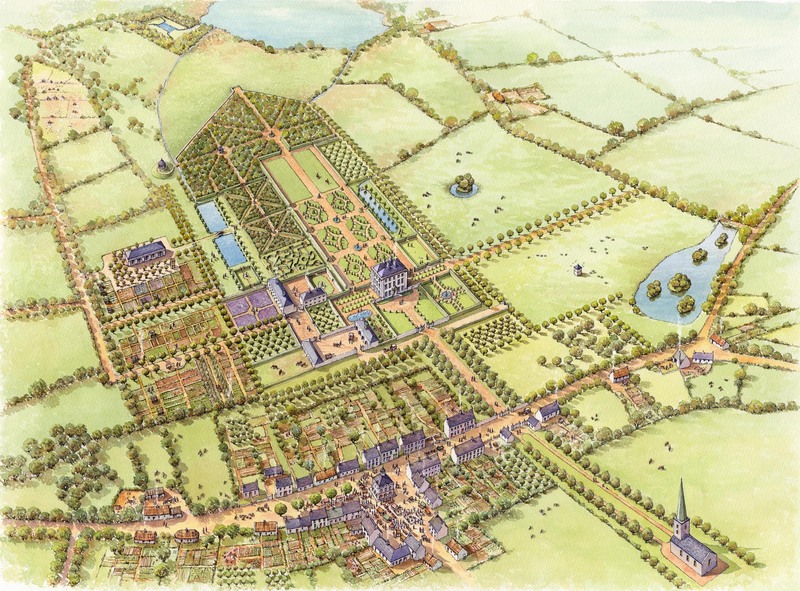 The gardens would have been quite formal with paths and clipped trees. 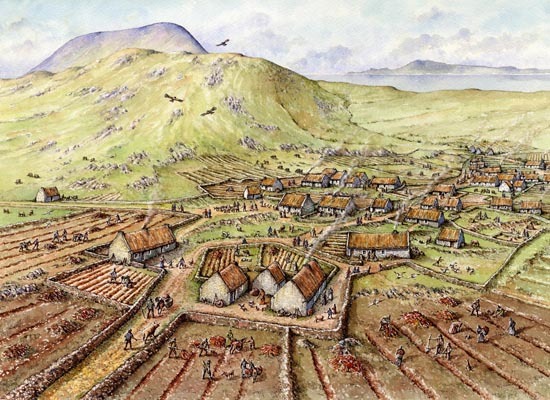 Enclosures outside of the bawn would have been used to keep animals and to supply vegetables and fruit. This view shows what the rear of the original 1770's Georgian House may have looked like. The windows were in the basement are suggested by the evidence of what is remaining. More light was probably required here as thes basement was vaulted and would only have had windows open at the rear, those at the front being below ground level.